Sunday night: Flights were nice, got to transfer through the new Terminal 5 in London Heathrow. For all its modern amenities, you have to take a bus from Terminal 5 to the other Terminals. Stood in line for 15 mins waiting for for the bus, which is a 10 minute ride to Terminal 1&2. It drops you off in the service entrance to the Terminal - I felt like The Beatles sneaking into the back door at Heathrow in the 1960s. British Air lets you watch movies and tv shows On Demand - fun! There Will Be Blood on a tiny screen is almost worth it. It's a trade-off though because they lost my luggage. Luckily I had 1 day of emergency clothes in my carry-on. Arrived in St. Petersburg. Monday: Visited Aunt Maya's and took a nap. 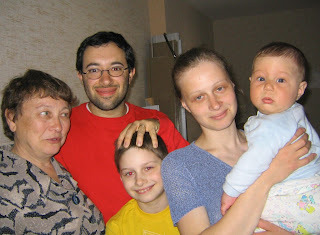 Spent the night at the dacha, hanging out with Maria, Leonid, Kostya, and Olga. Tuesday: Had no morning plans and walked around the city. 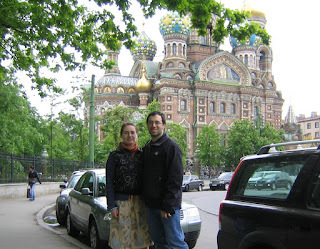 It's my luckiest day ever as every museum we went to (Peter I summer house, Church on the blood, Pushkin, etc) was closed!!! 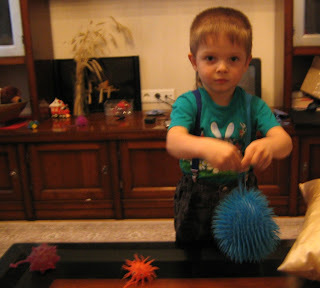 Some friends came over and we played cars and light-up squishy balls with little Misha (age 4). The airline dropped off my luggage tonight - yay! Wednesday: Spent over 2 hours at the Post Office getting my visa registered and stamped - courtesy of the "new simpler process". Missed seeing Bill because of the stupid post office. Visited with Nastya at a cafe near Nevsky. I tried ordering a bunch of different chocolate drinks, but no success. 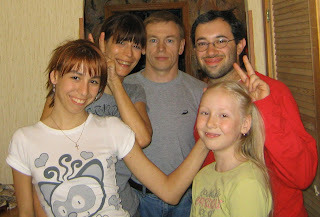 Met with friends in the evening and played the Q&A game with Dasha (age 8). It's like 20 Q's except the questions are not related and they are all non sequiturs. Read in the news that a museum we walked by on Tuesday discovered an unexploded WWII bomb - exciting! Thursday: Spent the day visiting with various sets of cousins. 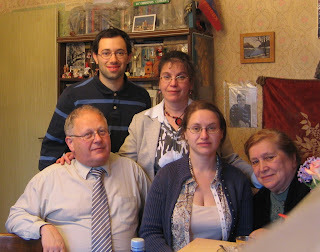 In Russia, everyone you visit with serves a meal, so we were dangerously close to exploding by the end of the day. Played legos with Maryk (age 9). Setup an obstacle course for windup cars so they would go up a ramp, jump over some lego toy cars, and fly over the finish line. It seems he will make a good engineer some day. Had a very tasty "live beer" (unpasteurized and unfiltered) with dinner. Watched the Disney movie Enchanted and did some magic and non-magic tricks with Katya (age 16) and Natasha (age 10). Friday: Toured the Akhmatava museum and met with the organizers that are hosting Olga's lecture next Friday. Tried to order coffee at the Chai'naya Lojka cafe, but was denied. The staff kept interrogating me in Russian - a nice lady behind me in line said they were asking if I really wanted a drink with no pancakes. Ended up getting a Japanese green tea, which was nice. Visit Aunt Maya's again and took a nap. Saturday: Nice low-key morning. Slept in, caught up on email, blogged.